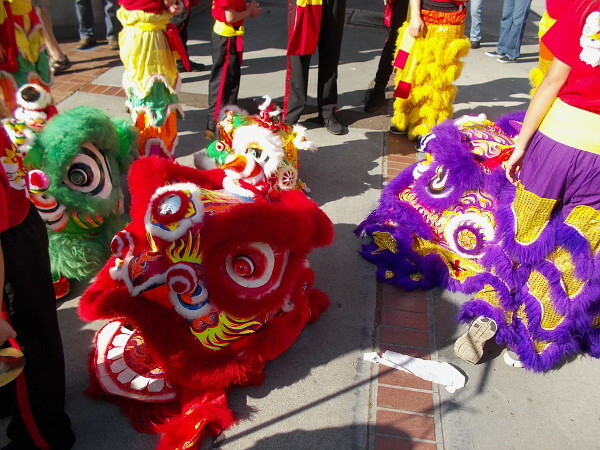 Lion dances and fun in downtown San Diego! – Cool San Diego Sights! 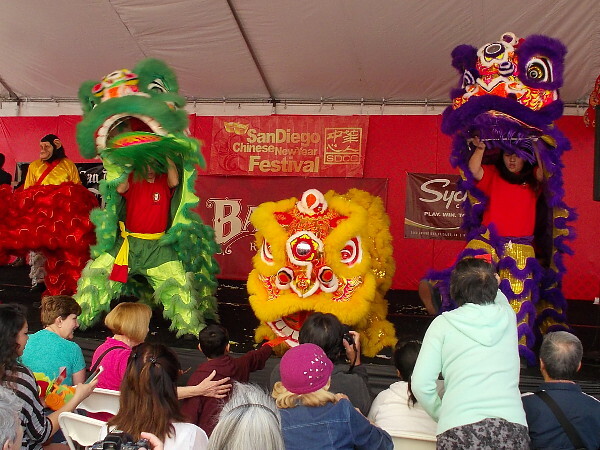 Lion dances and fun in downtown San Diego! 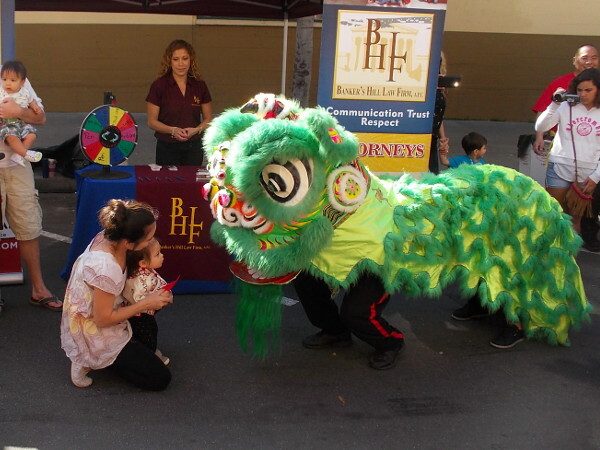 Lion dancer meets small visitor to the 34th Annual 2016 San Diego Chinese New Year Food and Cultural Fair. 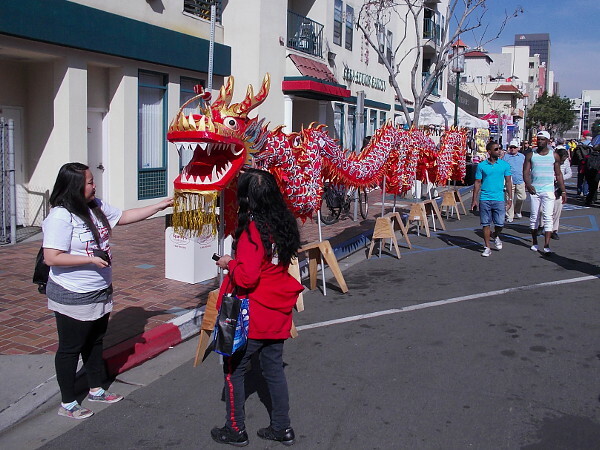 To celebrate the Chinese New Year, a special festival is being held this weekend in downtown San Diego, in the historic old Chinatown section, now known as the Asian Thematic District. 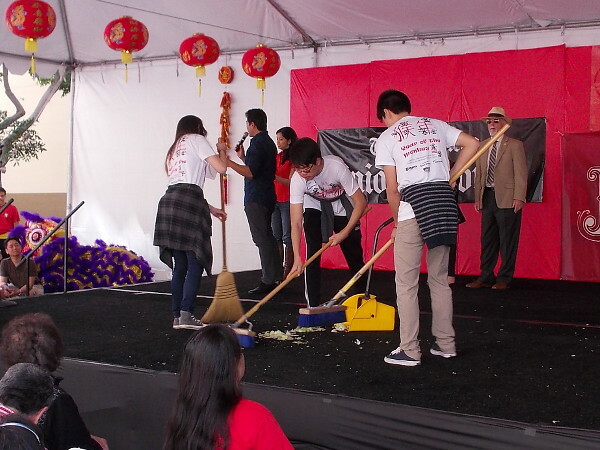 The event is called the 34th Annual 2016 San Diego Chinese New Year Food and Cultural Fair, and it’s being put on by the San Diego Chinese Center (SDCC). 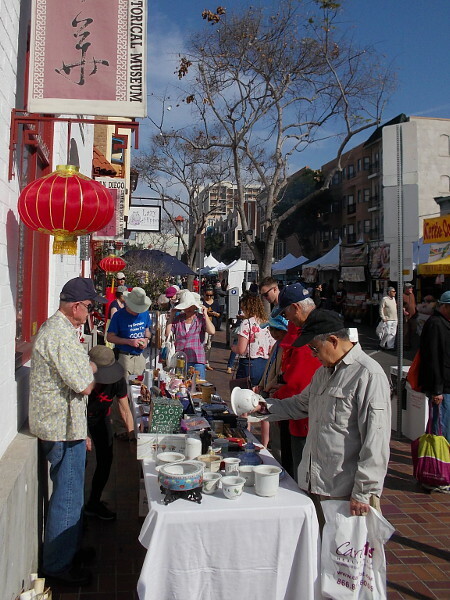 You can find the fun on two blocks adjacent to the San Diego Chinese Historical Museum. There are lion dances, drummers, temple dancers, story telling, a kung fu demonstration, and just lots and lots of cool sights. I walked through the festival this morning around 10 o’clock and observed the opening ceremonies. Here are some colorful pics! 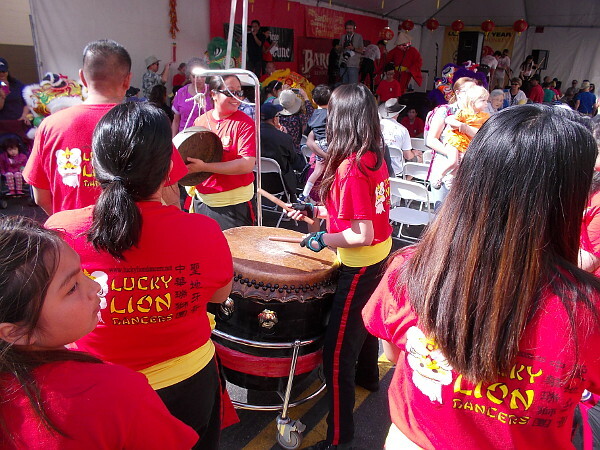 The CCBA Lucky Lion Dancers would soon be heading down the street through the crowd. Tables in front of the San Diego Chinese Historical Museum contain arts, crafts and many unique cultural objects. 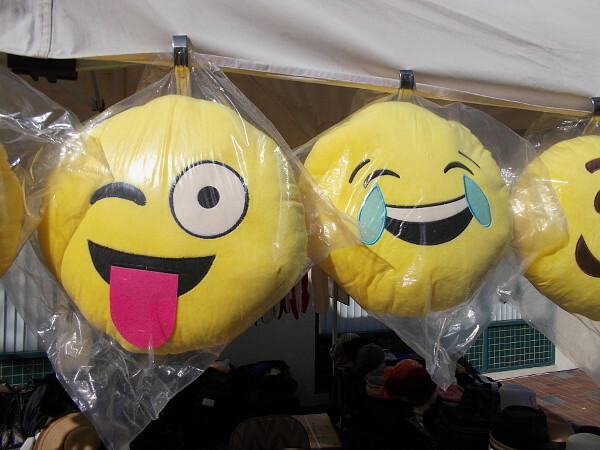 These funny faces were for sale in a vendor’s booth. 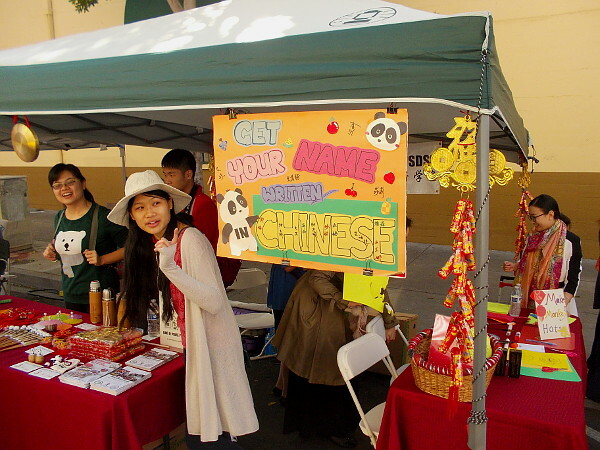 There was a lot of Asian food and a variety of colorful wares for visitors to purchase. 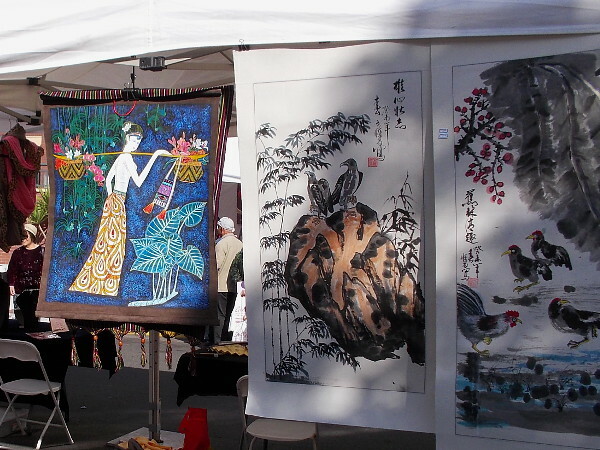 Uniquely beautiful art could be seen up and down the street during the San Diego Chinese New Year Food and Cultural Fair. Anyone could have their name written in Chinese! 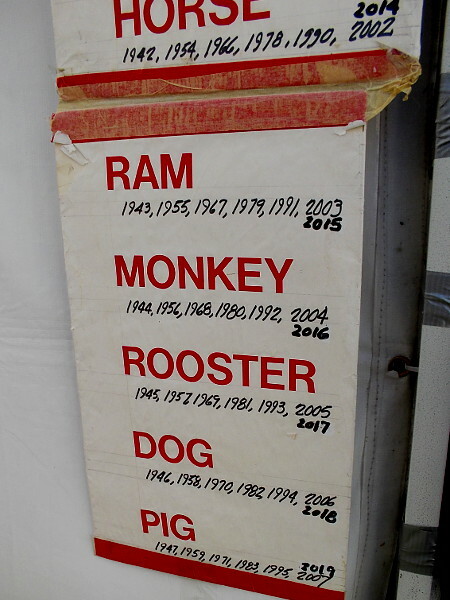 2016 is the Year of the Golden Monkey. Monkey is the ninth zodiac animal in the twelve year cycle of the Chinese calendar. 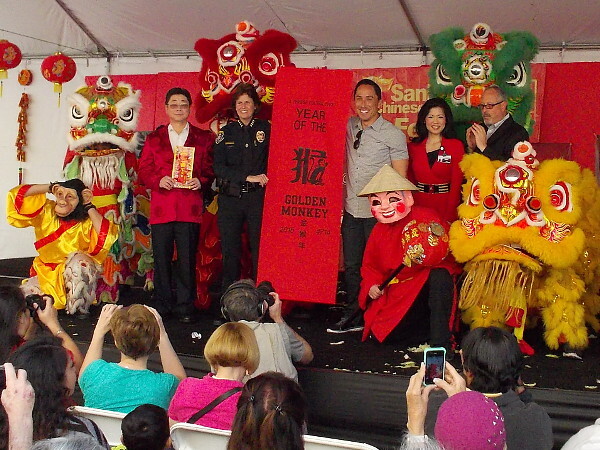 The opening ceremony included an elaborate lion dance on stage, then the display of this banner by San Diego dignitaries. The energetic, exciting lion dance resumed, and people fed the lions red envelopes full of money for good luck! An explosion of lettuce from the hungry lions during the dance was cleaned up on the stage afterward! Lettuce symbolizes a fresh start in a new year. A drummer helps spur the dancing lions, a Laughing Buddha and a monkey into action! A long Chinese dragon on display. I believe a dragon dance would take place later. One of many cool sights at the annual San Diego festival! If you enjoy my blog, you can follow Cool San Diego Sights on Facebook and Twitter! Do you like to read original, thought-provoking fiction? Please click Short Stories by Richard. Very enjoyabe Chinese New Year indeed, Gong Xi Fa Chai from Penang, Malaysia. We had a scorching day here in Wellington (Sunday 14 Feb) and enjoyed a colourful parade that ended on the waterfront. Events, including fireworks, dancing, a market, and displays were scheduled all weekend, but I only made it to the parade. It was. I took some photos for Facebook, but they can’t compare with yours! Have a great rest of the weekend! Weather over here is absolutely perfect! Yikes! That’s a bit chilly! Out here we’re in for another sunny warm day! Time for another walk! Hah! Well, Mr Smarty-boots, though I’m skulking indoors today (at a folk-music concert on the edge of town), Phyllis & I have plans for Tuesday! Previous Previous post: Give your hand to the Helping Hands Foundation! Next Next post: Incredible didgeridoo player adds life to San Diego!